With luxury villas and megayachts dotting the landscape of Saint Tropez, it’s easy to forget that a handful of people helped to catapult this sleepy fishing village into the phenomenon it is today. 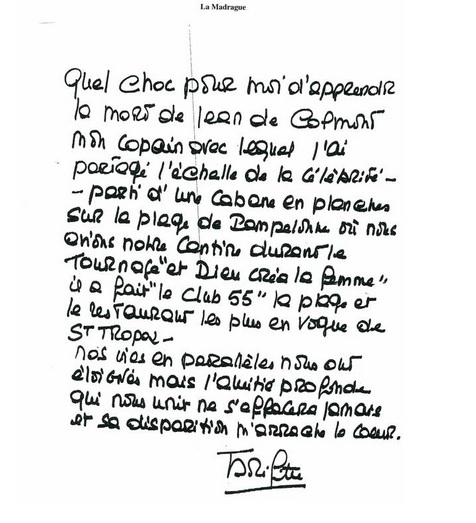 And this week, sad news from Saint Tropez, as locals mourn the death of one its legendary founders, owner of Club 55 and Les Caves du Roy, Jean de Colmont. The year was 1955, and Roger Vadim, Brigitte Bardot, and crew began filming the iconic beach scenes of Et Dieu Créa la Femme on the de Colmont property along the coast of Pampelonne. As Madame de Colmont set about feeding the film crew from a small beach hut, her husband quickly realized the commercial success of this small restaurant venture, and Club 55 was born. The young Jean de Colmont quickly struck up a friendship with Brigitte Bardot, and the two would spend the next decades as neighbors and friends, each witnessing the success of the film’s release, and living side by side during the glory days of Saint Tropez.